So you made a short documentary – now what? Who’s going to pay you for it? Or, you have a great idea for a short – who can you get to pay you to make it? 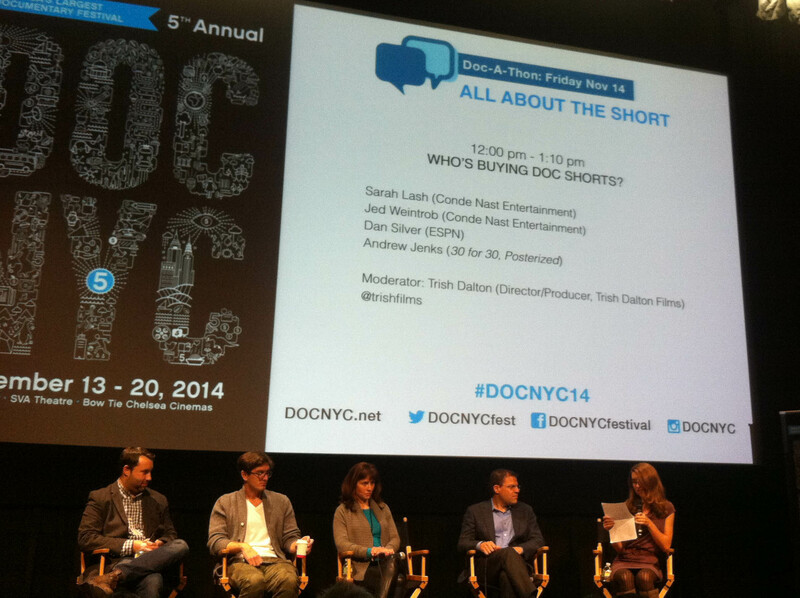 DOCNYC’s “All About the Short” day of panels included discussions of content, style, and new platform possibilities, but the audiences displayed the most hunger for information surrounding how to get paid for short documentaries. The second panel of the day (“Who’s Buying?”) focused on this issue, although the subject was also raised during the general panel. People are clearly interested in how to leverage this new zeitgeist of short filmmaking and what options exist for funding. “Who’s Buying?,”moderated by director/producer Trish Dalton, presented the perspectives of folks in the corporate, online sphere – Sarah Lash (Acquisitions) and Jed Weintrob (VP Production) for Conde Nast and Dan Silver (Director of Development) and Andrew Jenks (filmmaker) for ESPN. This entry was posted in Uncategorized on 21 November, 2014 by docuphile.